Over a month ago I posted the first part to the makeover to my desk. Would it surprise you to know that for three or four (or five?) 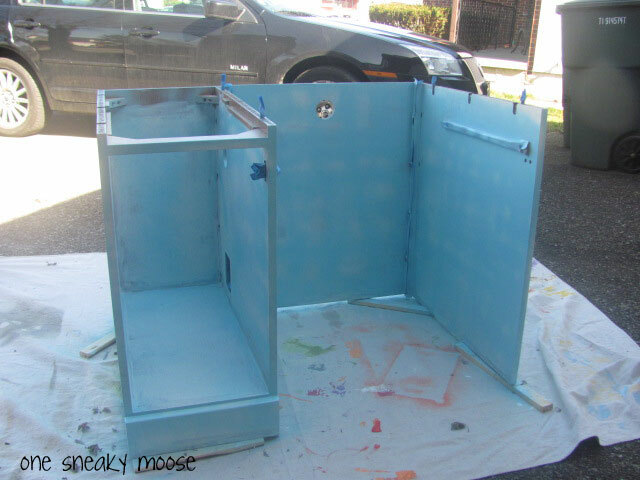 weeks, the desk sat in our living room disassembled with the first half all primed and the second half waiting to be primed? No? I’m not surprised either. I’m going to skip the part where I took it all apart. I took pictures of the process so that I could remember what went were. I put parts in bags that I labeled so that I knew which part was what. I’ll also forego telling you how some of the screws stripped and were a huge pain to get out which means I have to go search for some replacement screws. Tiny, tiny screws. 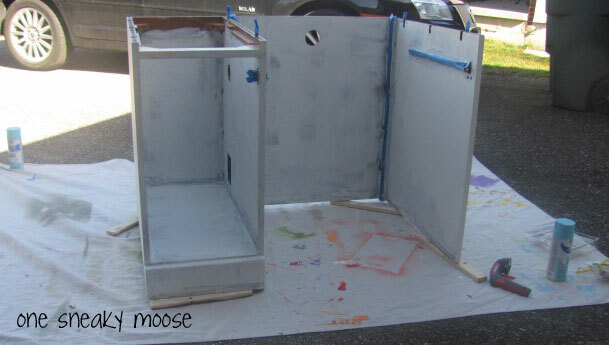 I’ll also skip the part where I primed everything. Just know, I primed it. I used Zinsser primer. The GOLD label. This is important if you don’t want to sand/are painting laminate/whatever. 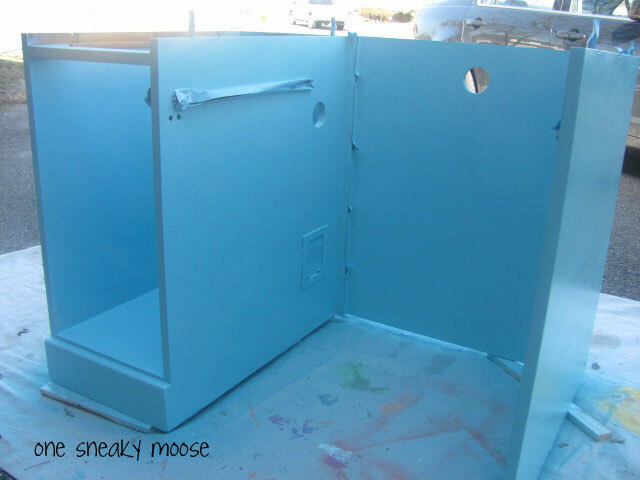 You get to skip the sanding part and go straight to priming and painting! (And not priming and painting for weeks…) The one sad thing about this primer is that it is oil based. Meaning, it doesn’t clean up with water. If you don’t have any mineral spirits on hand, use throw away gloves! And when you still manage to get a bit on your hair and arms, ignore it and it will come off in a day. Or a week. Because I dreaded the priming SO MUCH after the first go-around, I decided I’d spray paint the desk. More expensive, but it would happen much quicker. The problem was that it’s February. A weird sometimes mild, sometimes cold, sometimes snowy, and sometimes a balmy 60 February. So I prayed for good spray painting weather. Or maybe I just hoped. I didn’t expect to get my wish so soon! Today’s weather was super promising and in the 50s. Except I didn’t have the paint yet. I hadn’t even decided how I was going to paint it. Scratch that. I had decided how I was going to paint it. I also decided that I wasn’t sold on that idea. So I went to three hardware stores looking for adequate spray paint selection (I’m so so sorry, my faithful and trusty orange store–I will go to you first and save myself time!!). Kaelyn went too. She was a good sport throughout most of it. And the employees all thought she was adorable. She drew quite the crowd at Home Depot while I was agonizing over which color(s) I would buy. I didn’t take a picture of how my decision process worked. But I should have. I chose some of my considered colors and lined them in a row. I had 8 or 9 out. A few pinks (yes, I considered pink! ), some yellows, blues, and even briefly a brown. Jared suggested the brown when I was looking at colors last night. 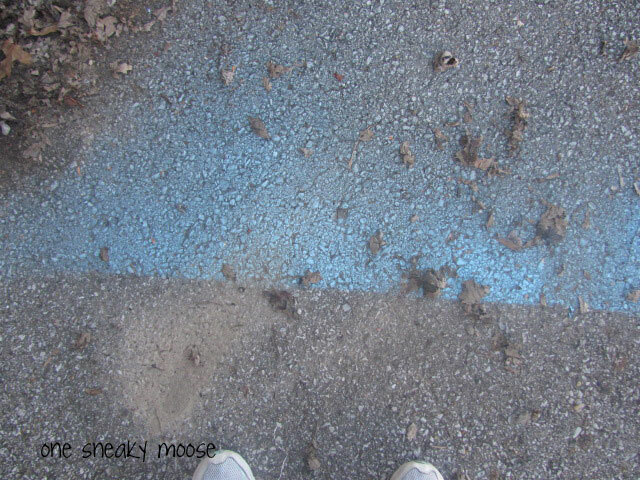 Then, I told Kaelyn that she was doing an awesome job as she walked across the spray paint cans (you know, with her feet on either side of the cans…). Then I talked to some employees who gave me some suggestions like (these two that you have picked out look really nice together). I narrowed down my selection. Kaelyn wasn’t happy that I was taking away cans. Have I talked enough? 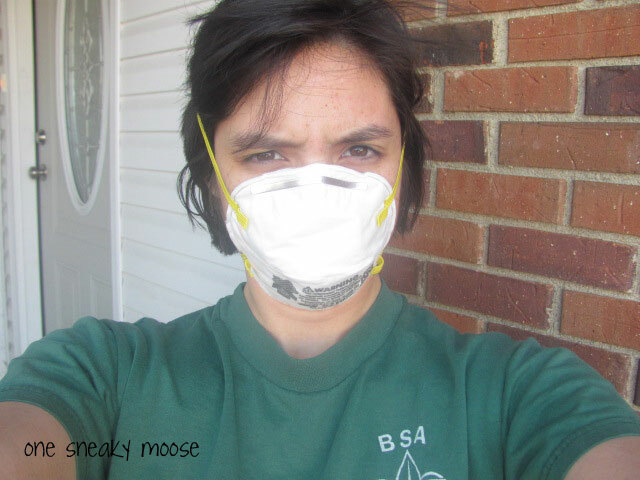 Let’s spray paint! Oh wait. First some “before” pictures. 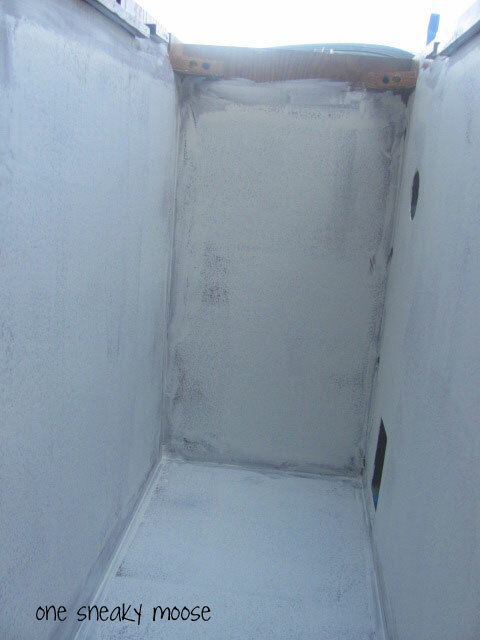 Here we are with a layer of primer. Remember, I used the Zinsser GOLD label so no sanding! And actually, on the first half of priming, I did two layers. On the second half, I did one layer. Call me lazy. This was just one layer. Yup, I’m on my driveway! Hi everyone driving down the street!! I’m just painting on a lovely day! With wind! I propped the desk up on scrap wood so that I could get down to the bottom of the desk easily. I taped off parts I didn’t want painted. I bought Rustoleum brand spray paint. I have always had good luck with their paint. I bought five cans and had one on hand of this color (pure coincidence!). So far I have used 3 and a bit. I think I got just enough! The handle you buy separate. I highly recommend it!! It makes spray painting so nice and easy. Much easier on the fingers. Jared bought it for me a long while back and so I don’t know how much it costs. Well worth the cost, whatever it is! Like I said earlier, my main color is AQUA. It is a Satin finish. 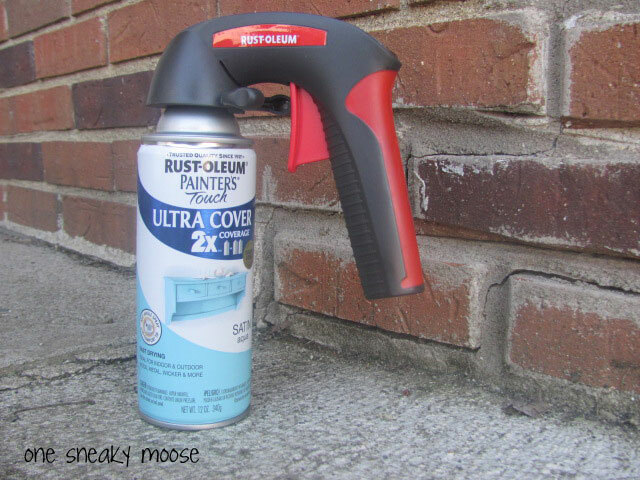 Do you know the best way to spray paint? LIGHT layers. Keep the can moving and expect to do more than one coat. I did two full coats and one or two touch up coats. If you do heavy layers (aka, leave the can spraying on one location for too long), you will get drips. You don’t want drips usually. Keep the can moving. This was just one layer of paint. You can still see primer! That’s okay. But look! After the second layer, we’re looking much more solid aqua. Another view of the desk after two layers of spray paint. After finishing this portion of the desk, I painted some drawers and doors. No picture… but they look like aqua. Our driveway got a bit of a facelift while I was at it. Too bad it won’t last once it rains! Hehe. Remember when I said it was windy? My EYEBROW and EYELASHES got paint on them. Yup. And my left arm reminds me of oompa loompas with a sheen of blue paint. 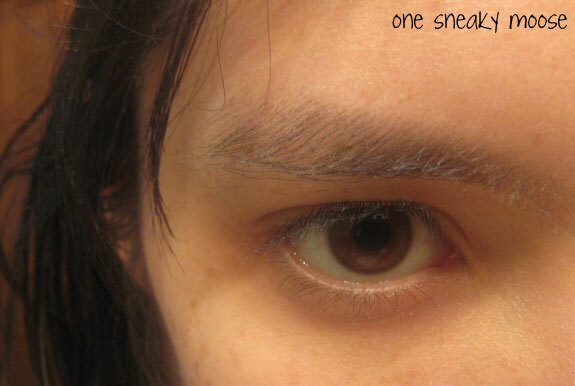 Why am I posting a picture of my eyebrow?